Through nine main games and additional material that includes novels, comics and short films, Ubisoft's wildly successful Assassin's Creed franchise exists in an impeccably detailed, ever-expanding universe. Things will expand further when a feature-length adaptation of the battle between Assassins and Templars hits the silver screen in December through 20th Century Fox. Bringing an original storyline to the same universe as the game series, Assassin's Creed sees criminal Callum Lynch (Michael Fassbender) rescued from execution by Abstergo Industries, a pharmaceutical front for present-day incarnation of the Templar Order. Participating in the group's Animus Project, Lynch relives the genetic memories of his ancestor Aguilar de Nerha, an Assassin in 15th century Spain. Assassin's Creed is set to arrive in North American theaters on December 21, but before heading out a screening near you, discover what other murderous memories the modern-day Templars have tapped into with our Timeline below. In Assassin's Creed: Altaïr's Chronicles, Altaïr Ibn-La'Ahad is charged by the Order of Assassins to retrieve the Chalice, a relic that is said to have the power to unite both sides and end the Crusades in the Middle East. After losing the Chalice and failing a mission for the Order, the first Assassin's Creed game sees Altaïr learn of the struggle between Assassins and Templars for powerful artifacts called Pieces of Eden, which are scattered around the globe. In discovering that Order leader Al Mualim is secretly a Templar, Altaïr kills him and takes the artifact, dubbed the "Apple of Eden." He then takes former Templar stewardess Maria Thorpe prisoner in Assassin's Creed: Bloodlines, and heads to Cyprus to investigate further Templar activity, uncovering a hidden trove of Templar intelligence and artifacts. After his father and brothers are executed by Templars, Altaïr's Italian descendent Ezio Auditore joins the Order of Assassins in Assassin's Creed II after training with his uncle Mario in Monteriggioni. His search to avenge his family's death leads him to meeting Templar Grand Master Rodrigo Borgia, from whom he steals the Apple of Eden by disguising himself as a soldier. By later defeating Borgia in a fistfight, Ezio gains access to a secret vault below the Vatican where he learns of a "First Civilization" that created humanity as slaves before they were wiped out by an unknown catastrophe. Humans and First Civilization survivors built a network of vaults to ensure they avoid a similar fate. Ezio then travels to Spain to rebuild the country's Assassin brotherhood in Assassin's Creed II: Discovery. In the animated short Assassin's Creed: Ascendance, Ezio learns of Borgia's illegitimate son Cesare's rise to power in Rome through Leonardo da Vinci. In beginning Assassin's Creed: Brotherhood, Cesare finds Ezio in Monteriggioni and kills Mario, taking the Apple of Eden for the Templars. Ezio then returns to Rome and begins rebuilding the Assassin brotherhood there to end Borgia's rule. After four years, he is appointed leader of the Assassins, causing Cesare to worry. Ezio finds the apple within St. Peter's Basilica and overwhelms Cesare's forces with its power. The younger Borgia escapes imprisonment sometime later, only to die by the hands of Ezio. The Assassin then hides the Apple in a First Civilization temple in Aracoeli. Assassin's Creed: Revelations sees Ezio travel to the Middle East in search of Altaïr's secrets. Ambushed by Templars upon arriving at the former Assassin's fortress, he escapes and discovers that five disc-like keys hidden around Constantinople can open Altaïr's library. Ezio witnesses the events of Altaïr's life following his travel to Cyprus, through collecting the five keys, and discovers his ancestor's skeleton and a sixth key upon opening the library. The sixth object reveals Altaïr had sealed himself and his Apple inside to protect the secret from the Templars. Ezio leaves Altaïr's Apple in its place. In the animated short Assassin's Creed: Embers, an older Ezio trains Chinese Assassin Shao Jun, before the student returns to China to battle Templars who destroyed the country's Assassin brotherhood. In the Caribbean during the golden age of piracy, Assassin's Creed IV: Black Flag finds pirate Edward Kenway battling the Templars to find another First Civilization site dubbed "the Observatory," from which anyone can be monitored anywhere in the world when a blood sample of the target is provided. Kenway discovers the Observatory and its artifacts with the help of a Sage, but is betrayed by his companion not long after. Jailed for his piracy crimes, Kenway soon breaks out with the help of Assassin Ah Tabai and joins the Order. He then finds the artifact and returns it to the Observatory, sealing off the site from the Templars. During the French and Indian War, Assassin's Creed: Rogue finds Colonial Assassin recruit Shay Cormac tasked with tracking down a Piece of Eden in Lisbon, only to question the motives of his Brotherhood when his attempt at taking the artifact results in an earthquake. Soon ending up in New York City after escaping the Brotherhood, Cormac uses his Assassin skills to quell gang activity, catching notice of the city's governor who offers him membership into the Colonial Templar Order. Cormac follows Assassins Achilles Davenport and Liam O'Brien to a First Civilization temple in the Arctic, discovering no artifact to be held there. With the Colonial Templars set to eliminate the remaining Assassins, Cormac spent the next 16 years tracking artifacts in the Brotherhood's possession. Serving as a direct sequel to Revelations, Assassin's Creed III finds Templar Grand Master Haytham Kenway (son of Edward) amongst the American Colonies with an amulet that is said to open a First Civilization temple. Haytham kills a slave trader in Boston, leading a woman from the group of freed Mohawks to help him find the temple. The two have a son, who witnesses his village razed and mother murdered as a child by whom he believes to be Templars. As a young man, he begins training as an Assassin under Achilles Davenport, taking on the name "Connor" to avoid discrimination. Haytham and General Charles Lee dismiss Connor's hope of a common goal of peace and freedom despite agreeing to a temporary alliance. In fighting his way through Fort George, Connor kills both and recovers the amulet, eventually hiding it away. In beginning Assassin's Creed: Unity, a French Templar Grand Master adopts Arno Dorian despite the fact his father was an Assassin. When the Grand Master was found murdered 13 years later, Arno is wrongfully imprisoned in the Bastille, where fellow prisoner Pierre Bellec invites him into the Brotherhood. Arno then looks to eliminate all Templars involved in the murder, assassinating the wrong man in looking to find De La Serre's killer. He uncovers French silversmith François-Thomas Germain's plan to spark a mass revolt in the country, tracking the Templar Grand Master's moves during the French Revolution to finally kill him in a crypt. During England's industrial revolution, twin Assassins Jacob and Evie Frye fight the corrupt Templar Order in Assassin's Creed: Syndicate while looking for a Piece of Eden known as "the Shroud." Said to be able to heal any injury, reverse aging and make the user immortal, the artifact is sought by criminal-minded industry figure Templar Grand Master Crawford Starrick. With the city lacking a Brotherhood of Assassins, the Frye twins enlist the help of everyone from Charles Dickens to Arthur Conan Doyle in chipping away at the Templar-dominated society. Alongside family friend Henry Green, the twins race Starrick to a vault in Buckingham Palace where the Shroud is held, teaming up to defeat him in spite of his artifact-given powers. In looking to provide a more nuanced depiction of First Nations Peoples in Assassin's Creed III, Ubisoft worked with a cultural liaison officer from Quebec's Kahnawake Language and Cultural Centre. The game also featured conversations in Mohawk language with subtitles for players; songs sung by the Kahnawake Men's Singing Society, and the sounds of Mohawk children playing. Having sold more than 11 million copies to date, Assassin's Creed IV: Black Flag was lauded by critics for its focus on sailing and ship-based exploration while also retaining the melee combat and stealth elements that made the previous installments a success. Naval combat and hunting, side-quests and an immersive open world structure garnered the title a wealth of positive reviews. Showing their interest in some more recent history, Ubisoft tapped a well-known Canadian talent to provide a soundtrack for their Assassin's Creed IV: Black Flag commercial. Prior to the game's release in October of 2013, the developer's 30-second TV spot featured a wealth of action scenes soundtracked by Drake's 2013 hit "Started from the Bottom." 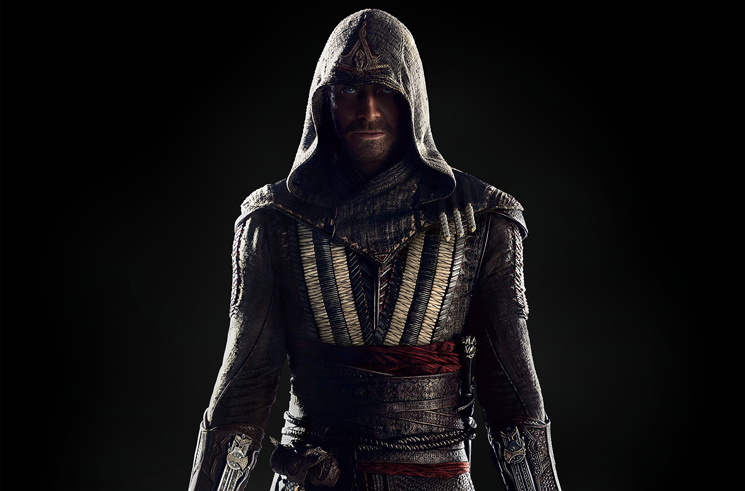 Assassin's Creed arrives in theatres nationwide on December 21. Take in the trailer in the player below.